The story behind the name: The pattern in the constellation Orion was recognized as a human figure by many ancient cultures. Orion's position on the Celestial Equator makes it visible all over our planet. Ancient Indians saw the figure as a king who had been shot by an arrow (represented by the stars in Orion's belt). Ancient Egyptians thought the stars in the belt represented the resting place of the soul of the god Osiris. The Arabs saw the constellation as the figure of a giant. 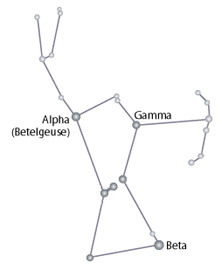 The constellation takes its name from the Greek stories about Orion, a legendary hunter. The stories about Orion are only loosely connected and exist in several variants. Some are thought to be derived from earlier stories from more ancient cultures. One myth says that Orion was banished to the sky for boasting about how many animals he would kill (to impress Eos). He and his hunting dogs, Canis Major and Minor, chase the constellations representing animals, but can never catch them. There are two legends about Orion's birth, both relating him to water. In one, he is the son of Poseidon and Eurayle, one of the three daughters of Ceto and Phorcys. In the other, he is the son of the widowed bee-keeper Hyrieus, conceived from a sacrifice to the gods that may be related to an ancient African rain-making charm. In this story he was named Urion, "maker of water". His birth legends may be connected to the seasonal rains that come near the rising and setting of the constellation. The Greek myths of Orion's death and subsequent placement in the sky may also be connected to legends from other ancient cultures. In one myth, Artemis fell in love with him and was tricked by her brother Apollo into killing Orion with an arrow. Artemis begged Ascelpius to save Orion, but Zeus killed Ascelpius as he was trying. Artemis set Orion's image in the stars. This story may be related to the Hittite legend of Anat, the battle-goddess who falls in love with a hunter but accidentally causes his death when he refuses to give her his bow. There are several stories of Orion being stung to death by a scorpion. These may be related to an Egyptian myth about Horus, the child of Isis and Osiris who met a similar fate, or to the Babylonian story of the attack on Gilgamesh by the scorpion men. Another version of the scorpion story has Artemis unleashing the scorpion to punish Orion for having pursued the seven Pleiades. All of these stories seem to recognize the astronomical phenomenon that Orion and the constellation Scorpio each rise as the other sets. In one version he is chasing the scorpion to try finally to kill it. In another he is forever running away or hiding from it.